Whether you are at the beginning, middle, or prime of your leadership career, navigating the political landscape in many organizations can be frustrating and depleting. Have no fear: Master Executive Coach and best-selling author Suzi Pomerantz, who is one of the pioneers of the coaching profession, joins me to talk about how to lead ‘difficult people’, cultivate effective strategic career relationships, and specific tips to move your career ahead by being connected to the right people in the right way. Plus, listen to the end to hear a special announcement and invitation from me (Halelly) to an exciting new offering just for listeners of the podcast! Check out Suzi’s author page on Amazon and all her books! Like the new Facebook page of the TalentGrow Show and join the new Facebook group – The TalentGrowers Community! Share your advice, your progress, your successes and your challenges or questions. Interact with other listeners and with me, let’s support each other in becoming the kind of leader people *want* to follow! 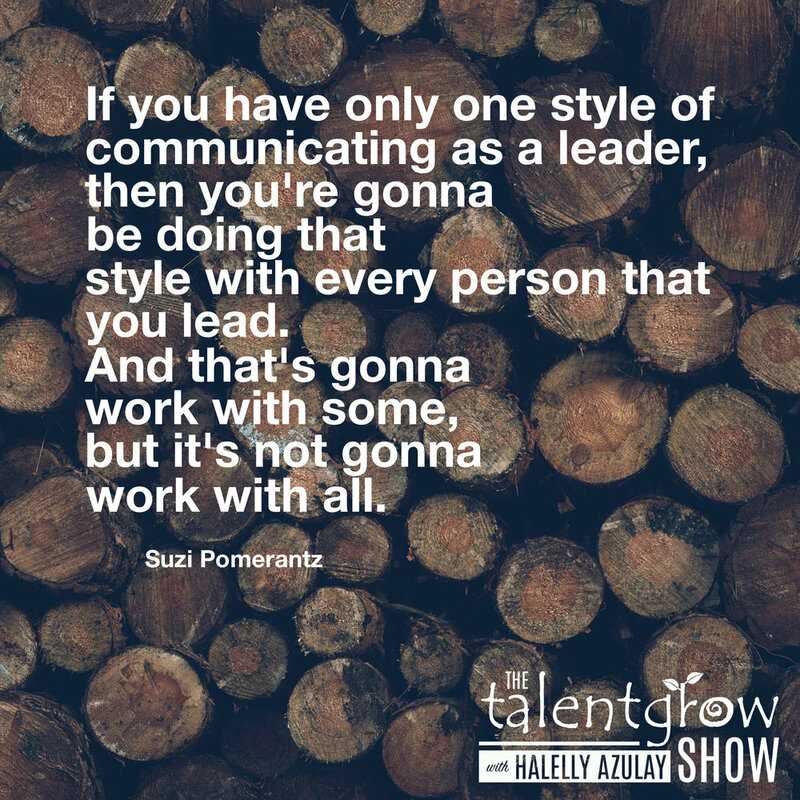 Suzi Pomerantz, CEO of Innovative Leadership International, LLC is an award-winning executive coach and international bestselling author with 24 years’ experience coaching leaders and teams in 200+ organizations internationally. Suzi specializes in leadership influence, helping executives, teams and organizations find clarity in chaos. She was one of the first executive coaches to receive the Master credential from the ICF 19 years ago, and is a thought leader in the industry. She served on the IJCO Editorial Board, ICCO Advisory Board, International Executive Coaching Summit board, Harvard Business Review Advisory Council, and Forbes Coaches Council. She has authored over 30 publications about coaching, ethics, and business development, and 11 books including her bestseller, Seal the Deal and #1 international bestseller Ready, Aim, Captivate, co-authored with Deepak Chopra and others. She founded the Leading Coaches' Center and co-founded the Library of Professional Coaching. Halelly: Hey there. Welcome back to the TalentGrow Show, to episode 46. 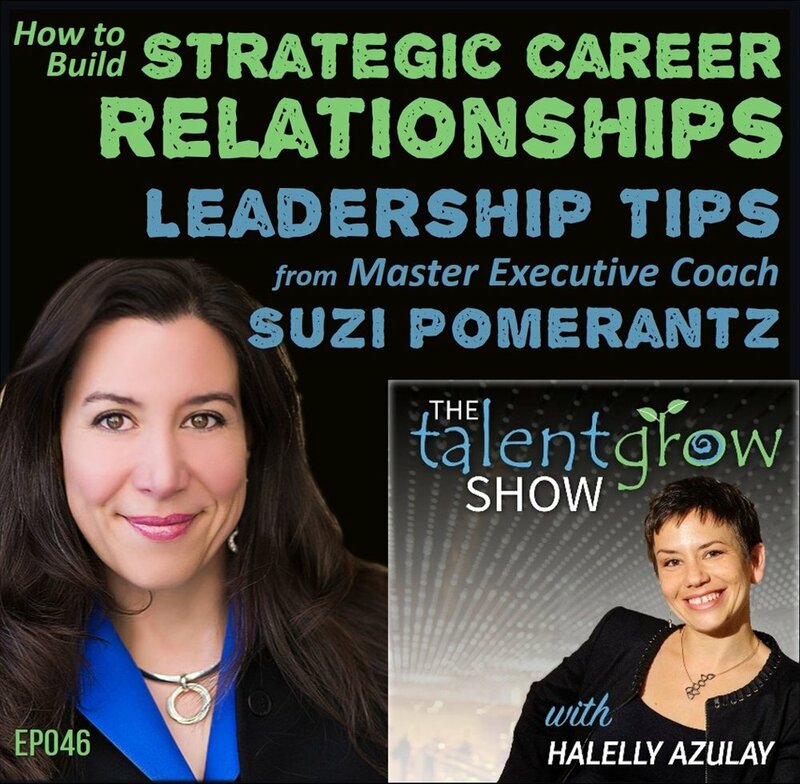 I am Halelly Azulay, your leadership development strategist and this time my guest is my friend and colleague, and a woman I greatly admire, master certified coach, facilitator and best-selling author Suzi Pomerantz. Suzi and I talk about a lot of very common challenges that she sees in her clients and how to deal with difficult people at work. She gives you actionable advice and what to do. If she were your coach, what she would suggest you do. She also talks in general about how to navigate the organizational, political landscape, and to cultivate all kinds of positive, effective, career-building relationships. She gives specific tips and advice for how to make sure that you have relationships in each of four key categories – allies, advocates, champions and mentors. She explains all of the differences between these different categories, and also how to go after these kinds of relationships. Listen to this episode, but stay tuned until the end because I have an exciting announcement and an invitation I cannot wait to share with you. Here’s episode 46. Welcome back to the TalentGrow Show. I’m Halelly Azulay, your leadership development strategist. This week I have a guest, Suzi Pomerantz. She’s an award winning, internationally credentialed, master certified coach, a facilitator, and a best-selling author or co-author of 11 different books. She is actually one of the first people in executive coaching and she now is involved with training and supporting other coaches in addition to running a very successful coaching practice for over 23 years, with over 200 organizations worldwide, like Deloitte, Accenture, PricewaterhouseCoopers, DuPont, Freddy Mac and the FBI, just to name a few. Suzi, welcome to the show. Suzi: Thank you so much for having me Halelly. It’s wonderfully to be here. Halelly: It’s exceptionally great to have you. Before we get started talking about coaching and the things that you’ve learned along the way, I really love to have my guests describe their professional journey. Where did you start and how did you get here? Suzi: Ah, yes, the dirty dark past! I actually started as a schoolteacher. I got my Master’s in teaching at the same time I was working on my undergraduate degree at the University of Virginia. What was remarkable about UVA is that – and this is quite some years ago, more than 25 years ago – they had this philosophy of student self-governance, where students took on leadership roles throughout their time at the university. This was all part of Thomas Jefferson’s original philosophy of development and growth and learning. I had the opportunity to lead organizations throughout my college and graduate school tenure that in other institutions would have been Master’s level paid positions. So it was really there that I first cultivated my love and passion for leadership, and when I got out and started teaching, I really had a tough time of it. I really only taught professionally for three years in the school systems, and each year I changed to a different environment because I was miserable. I kept trying to make changes. I went from rural to suburban to inner city. I changed grades, I changed entire schools. I just kept trying to make changes each school year and finally after three strikes I realized, “I’m out. This is not why I got into teaching,” and I didn’t know what I was going to do next. I gave myself a six-month period of time. Really, I say I gave it to myself, but in reality, that’s how much savings I had left. I had enough money to live for six months before I had to go do something else and during that time, I just started interviewing as many people as I could find, doing informational interviews. In that six months, I interviewed 150 people, and that’s where I learned a lot of really valuable lessons about networking and follow-through. It was during that time that I not only met the president of a company that was doing transformational consulting and executive coaching that brought me in and put me through a year-long really rigorous training, but it was also during that time that I was taking leadership courses, which I had been doing all along, just because that was what I was passionate about even while I was struggling through my three years as a teacher. And then I had started volunteering in the place where I was taking leadership courses as what they called a coach. It was kind of all of those things at once that pointed the direction for me to start my own coaching business and I had a lot of help and support from mentors and a lot of guidance in doing so, because I was at the time 24 years old and didn’t know a thing about how to start a business. Halelly: You’ve been extremely successful, an entrepreneur ever since, right? Suzi: Ever since. No looking back. It was fabulous. I learned a lot those first two years, so if any of your listeners are thinking of starting a business, I’d say give it a good two years. In those first two years I learned so much, but I was also in debt. You recall that I had six months worth of savings and I used those doing informational interviews, so then I started living off of my credit cards, which I did for the first two years of my business. I did have income, but it was not enough. I learned some really important lessons in those first two years where at the turning point where I was about to either go get a PhD and figure out what I wanted to be when I grew up or commit fully to my coaching business, I met with my coach at the time who really had a pivotal conversation with me, where he basically said, “Okay, if you had gone to get an MBA, how long would that have taken you?” I said, “That would have been three more years of school.” He said, “Okay, so you’ve invested two years and if you had purchased an MBA, what would that have cost you?” And I made up the number, I said probably upwards of $30,000. And he said, “Right. So how much are you in debt?” At the time I was $10,000 in debt. So he helped me reframe that debt as money I had invested in learning. He said, “Okay, so you’ve spent $10,000 and two years of your life. What do you have to show for it?” It was that conversation that helped me identify what are the things that I’ve learned that if I apply my learning could make all the difference. And that was a turning point. Six months from that point, I was sustainably earning six-figure revenue in the business and growing from that point on, and that was 24 years ago. Suzi: That’s what it must have looked like to him. Funny. Halelly: That’s when coaching wasn’t even cool yet. It was like nobody even knew what it was. You were truly a trailblazer. I know that you’ve talked to so many hundreds – probably hundreds of thousands – of leaders along the way, so I think you have a pretty good finger on the pulse of what are some of the challenges that leaders are facing? What would you say is either most common or the biggest challenge that you’re seeing right now, leaders face? Suzi: It’s hard to narrow it down to just one. It’s a great question. It depends on the level of leadership. If we’re looking at new leaders, they are often challenged with, “Okay, I’m a master at whatever I’m technologically proficient at, so I’m a really good practitioner of whatever my skillset and mastery is. I have the knowledge and skills of whatever has gotten me promoted into this leadership role, except now the game is a completely different game because as a leader it’s a completely different skillset.” What happens is this sort of mental interrupt, like a hiccup mentally, where leaders go, “Oh, wait a minute. I’m really great at whatever I do and that’s how I got to this level of leadership, but I’m a complete beginner at how to lead and manage people.” So that’s a really big concern at that level. Then I would say sometimes that’s categorized as moving from conscious competence to conscious incompetence. And sometimes there’s also a healthy dose of unconscious incompetence along with it, because we all have blind spots and we don’t know what our blind spots are. So that’s a piece of that level. And then I would say at higher levels in the organization, at more middle levels, the biggest concern happens to be typically either around navigating your career toward promotion – how do you navigate the politics of the organization, how are you savvy in terms of the balance between self promotion and humility or whatever you value – but then at the same time at that level, the middle level, there also seems to be great concern and challenges around handling difficult people and leading difficult people. There’s usually someone that’s making you nuts at that level. It’s either a peer or a boss or typically someone that you have to manage and lead and it’s learning new ways of communicating in order to be effective with whoever the challenge is. Halelly: That’s a common and difficult challenge. So I want to talk more about that navigating the career connections and making opportunities come up more, but let’s just put a pin in that for a moment. Let’s come back to the difficult people. What would be – we can’t go through all of it of course in this amount of time that we have together – but what would be how you start helping someone like that? Suzi: Well, so every coach is going to have a different approach. This is the thing I would say, if you are someone who is struggling with, let’s say you lead difficult people and you’ve tried everything you know to try, I would say if you are seeking coaching, be thoughtful around interviewing a number of different coaches and then go with your gut to choose the coach that resonates the most for you. Because every coach is going to have a different approach here. But I can tell you what I do is I encourage leaders to keep a track sheet, like a list. It can be a spreadsheet or it can just be handwritten, however you want to do it, of all of the people that you interact with. But in particular the difficult ones. And then keep track of whatever you can learn, either by directly asking them or by observing what is it that motivates them? What is it that demotivates them? What matters to them? What do they care most about? What are their hopes and dreams? If you can ask them those questions and find those things out, then you have a way to connect with them that might remove your frustration. Because then, whatever you’re trying to get them to do or understand or see or think differently about, if you can hook it and connect it to something that they care about, then they’re more likely to be able to hear you. So it’s about really altering your natural communication style in a way that resonates for the other person so that they can hear you. It’s not about changing your personality as a leader. It’s really about, “Okay, here’s a person who isn’t hearing what he or she needs to be hearing in order to grow and develop or succeed or do whatever I need them to do. So let me find a different way of communicating so that they can hear.” And that’s really the job of the leader is to observe and know people at that level so that you can not manipulate – that’s not the right way of thinking about it – it’s more like how can you adjust within your natural style, but adjust and try different strategies that will be more effective in reaching the people that you’re finding to be difficult. Halelly: Great advice. So much of leadership is about adapting and stepping outside of your own preferred style or comfort zone, and maybe even – as you mentioned earlier – even your favorite skillset and trying to make a bridge to other people on their terms as much as possible. That’s a great shift and reframe of how they think and I bet that that’s extremely helpful to those leaders if they’re open to what you’re suggesting. Suzi: Right. You know the saying, Halelly, if all you have is a hammer then everything is a nail, you know, every problem looks like it needs a hammer. So if you have one style of communicating as a leader, then you’re going to be doing that style of communicating with every person that you lead and that’s going to work for some, so you’ll get validation that it works, but it’s not going to work for all of them. The ones that are the most difficult are typically the ones that in some, there’s all these assessments we can take. I guarantee on some assessment they’re the opposite quadrant from you or whatever the opposite of the spectrum of whatever assessment you’re taking. I know that’s a generalization, but typically the people that are kind of on the opposite end of the spectrum from us are the ones that cause us the most difficulty. Halelly: Yes, and they are the ones that can probably bring you so much value because they’re bringing that different perspective and that different skillset. That’s probably your weakness and they’re rounding you out. So let’s talk more about that navigating the career field, I guess, or minefield probably, and how you help leaders when they’re thinking about making relationships and navigating internal politics. That’s, I know, a big concern and you just mentioned it as one of the big concerns you’re seeing or challenges. So what are some tips that you can share for cultivating those internal relationships in a way that allows you to be more influential? First of all, who can I trust? And second of all, who do I see to have influence in the organization? And how do I cultivate and develop strategically my relationship with those people I see have influence? I start by making a list. Make a list of all the people you see in your organization that have influence or that seem to be really good at however you define navigating the culture or the landscape. So whether they’re good at the game playing or whether they just seem to be the kind of person that always gets the opportunities or whether they seem to be a connector or whether they’re well-liked or whether they get promotions that you don’t think they deserve because you know their work ethic but they still seem to be rising above … whatever that is, find those people and cultivate a relationship with them strategically. Make the list and strategically go about developing a relationship with them. Because here’s what you want to find out. You want to find out who do they trust, first of all? How do they see and analyze and assess the politics, if you will, of the organization? I would ask them directly, “How do you see our culture? Who do you see are people that you can trust? How do you build influence? And how do you go about influencing leaders in our organization?” You’ll gather a lot of data from these people who seem to be good at it, from which you can pull out the things that are most relevant or resonant for you and your style. It’s also really a matter of figuring out first of all with curiosity and interest, being more interested than interesting, you’re not so much trying to promote your platform as you are trying to seek to understand who people trust and how decisions are made and how people are influenced, those who make the decisions. How they’re influenced and by whom. You can map this. You can draw a map of how these relationships work in your organization and become a student of it and start to look at where can you add value and contribute to the people who are influencers? And when you start to look at how you can contribute and add value to them, it necessarily comes down to what matters to them, what do they care about and how can you be of support or service, to whatever matters most to them? That’s where you start to really cultivate those relationships. I’d also say it’s worth doing some kind of analysis or audit of all of these people who are influencers in your organization to determine who are my allies? Who can I count on already that are aligned with my values and thinking, who kind of see things the same way I do? So these are my allies. Who are my allies? Who are my advocates or who do I want them to be? Who are the people that can go and speak to influencers on my behalf? Once you know who your advocates are – who they are already or who you want to invite to be your advocate – then you also want to clarify, “What is my narrative that I want them to be able to share?” You want to spoon-feed them the narrative so that they know that they’re representing you and your story and your talents in the most appropriate and effective way. The third type of relationship you want to cultivate is champions. Who are my champions? Or who do I want to be a champion of mine? Sometimes you have these people already. Sometimes it’s a boss or some kind of internal career counselor who can be your champion. But sometimes you don’t have a champion and if you don’t have a champion, you want to go find and cultivate and request that someone be your champion. That’s going to take some challenging conversations, because you need to find out what would you need to see or know from me in order to be able to be my champion in this organization? So you’d have to test that alignment on multiple different levels to be able to have a champion. The fourth kind of person that everybody needs – and you probably need more than one – are mentors. And mentors are people who have done what you’ve done, gone before you and can help you see how you should be seeing the organization, think how you should be thinking about the organization, in order to be getting ahead. They’re also like a sounding board for you inside the organization too, because they’ve walked the path before you and they can shed light on the places where there are stumbling places in the path, where there’s a roadblock or a pitfall or a hurdle of some kind. Halelly: So help me understand, what’s the difference between advocate and champion? I’m not sure I’m clear on the difference. Suzi: Good question. So an advocate is someone who in the process … I’m talking now about really large organizations, where they have a formal process for how people get put forth for promotability. Typically there’s layers of meetings and conversations, and an advocate is going to be a person who can advocate for you when your name is put forth by someone else. They may or may not be the person putting your name forth for promotion. But an advocate is also someone who can speak up on your behalf to someone who maybe is an influencer who doesn’t necessarily see you in the best light. So they can advocate on your behalf. They can correct that person’s awareness by saying, “Oh, that’s not how Halelly shows up for me. She’s a wonderful person.” They can advocate on your behalf to correct someone’s misperception or ill-informed perception of you. The champion, on the other hand, is someone who takes it upon themselves. They have personal ownership in your success and they take it upon themselves to help you navigate for your success. So they are out there on your behalf, in the organization, trying to find out who are the influencers, who do they need to be talking to on your behalf, who is going to be involved in the decision-making about your advancement opportunities? They’re actively campaigning on your behalf, so it’s different than an advocate, because it’s a more active role. It’s a more owned role. You really only need one great champion, but you might have multiple advocates. Halelly: Oh my gosh. I wish we had so much more time because I have so many follow-up questions I want to ask you! That’s fabulous. Really quick, just to concretize this a tiny bit more, I love the suggestion of making the list and to become an observer and to even talk to people, to learn about who do they trust, how do they do what they do. What should people actually do to get that information? I’m thinking should you do informational interviews or should you just sort of try to buddy up to them and get that information kind of informally? I guess the thing that cops to mind is that there are some places where either the culture is one of mistrust or that there is a relationship of mistrust between you and that person, and would they really share this information with you? Or would they question your motives? Suzi: If there’s a relationship of mistrust with that person, I wouldn’t approach them – I would assume they would question your motives. I know I would if someone I didn’t trust came up and started asking me who I trust, I’d be like, “Wait a minute! We don’t have sufficient relationship to go there. I’m not sure I’m safe to share with you who I trust because I don’t want you going to them and using my name to do something that I don’t trust.” That’s a great point that you bring up. You have to be conscious and aware and strategic about it, and I think it also depends on the culture of your organization. If the culture of your organization would allow for informational interviews, that’s really a great way to do it. Then you’re not asking anybody for anything. You’re really just there to learn and you’re interested and most people are happy to pay it forward in that way, or just to talk about themselves if they have a big ego. I find that that’s a really non-confrontational tool, that information interview, because most people are willing to grant you 15-20 minutes of conversation. I also think that informal ways are really helpful too, as you can just call it internal networking. People don’t have to know that you’re actively trying to figure out, “Who are my advocates, allies and champions and mentors?” In the initial conversation, you’re just internal networking. This is particular useful when you’re at a new level of leadership, because that then becomes the context of why you’re reaching out, or if you’re new to the organization is a great time to do that. Really you can do it anytime, even if you’ve been there 30 years and haven’t just been promoted, you can say, “Hey, you know what? I’m just learning about leadership. I was listening to a podcast and there was this idea about doing some internal networking and I realize I’ve been here 30 years and I don’t really know who the players are. I don’t really know what people care about or what matters to people, so would you be willing to have a 15-minute interview with me so I could figure out what do you care about and how can I be of support to what you care about in the organization? I’m just looking to connect more strategically with key players in our organization.” Most people would be willing to have that conversation with you. I think if it is a relationship of mistrust, first what you have to do, I would probably personally avoid that personally. But if they’re really an influential person in your advancement, then you have to repair that relationship. That’s a whole different podcast. Halelly: True! Let’s have it. Let’s schedule it sometime in the future. Good. I appreciate that because I know some people are like, “I don’t even know how to start.” I think that this gives listeners ways to get this started and I really appreciate how you describe that by being transparent and authentic. You don’t have to pretend. You don't have to put on your game face. Most people are going to actually really appreciate that honesty of you saying, “It sort of came on my radar whereas before it wasn’t. Hopefully you wouldn’t mind sharing some insights with me.” That way you understand their intentions because you’re being transparent about them. Suzi: And also most people are responsive if you ask them for help in some way. If you say, “Really, I could use your help. I want to pick your brain,” or that kind of language inside an organization really people love to be helpful. And in many organizations, there’s a metric and their performance around being helpful in that way. They get to check that box, that they helped mentor or guide or develop someone in the organization. People are much more open to it. I put that caveat of inside an organization, because I do know that entrepreneurs, particularly successful entrepreneurs, tend to get a little testy if you ask if you can pick their brain, because they don’t want to necessarily give away what they get paid to do for free. But inside an organization that’s a very safe way to put it. Halelly: Yes. I agree. Good. Well, this has been extremely helpful and I think very informative. Before we wrap up with one actionable, additional actionable tip since you’ve given very actionable tips already, what’s new and exciting on your horizon these days Suzi? Suzi: Well, I’m finishing up the year, looking forward to what my goals are going to be for the next year and started thinking about that. Really what I’ve been doing is experimenting with scaling my coaching business and I’ve had two or three years of success with scaling through colleagues and other master coaches. But what we’ve been doing that’s been really innovative that I’m excited about is we’ve pulled together a really top-notch swat team, if you will, of master-level executive coaches and OD practitioners and leadership experts that work together really well and effectively to do a coordinated intervention at the leadership level. We’ve done a number of organizations where we’ve gone in and worked with the top three tiers of leadership in large-scale organizations. What happens with a coordinated intervention at that level is massive, rapid transformational change. So much so that not only were we surprised but the clients were surprised at how quickly and effectively change happened. This is in support and in addition to, complimentary to, one-on-one executive coaching with the number of leaders that wanted that. This is a combination of team coaching and group coaching and individual coaching, and cross-team communication. There were so many layers going on at once that what I’m excited about is the opportunity to try that in different kinds of organizations. More organizations and see how effectively we can grow and scale that. Halelly: That is exciting. Because when you do coaching one-on-one, one-by-one, you have a certain amount of impact you can make. When you transform an entire organization, that’s really satisfying and important work. Suzi: What we found is the result, and we have all this data to back it up which is really kind of fun. It just really amplifies and accelerates the impact, so it happens bigger and faster. It ends up being a cost saving for the organization. It’s this win all around because it doesn’t take as long and because a lot of people are involved, the whole top three leadership tiers of an organization are involved in the transformation at once, everybody gets aligned really quickly and they’re able to really address the breakdowns and challenges and move through them much more quickly than the traditional ways we’ve been doing it. Halelly: Great. Cool. So before we tell people how to keep in touch with you, what’s something that you suggest that listeners do today or this week that can ratchet up their leadership effectiveness? One actionable tip that they can take? Suzi: I would say building on what we were saying before, I would say if you haven’t consciously and strategically thought about building and cultivating these strategic relationships of influence in your organization, think about first of all what would your purpose be for doing that? It could just be for navigating the internal politics. It could be for a promotion that you’re up for. It could be for something as simple as you have an idea of a way that things could be made better or different and you want to get your idea bought into on multiple levels of the organization, so I think about that as internal sales, in that way. Because you’re selling an idea. First thing about your purpose – why, if you haven’t been strategically building and cultivating these relationships of influence, think about what you would want to. What it could do for you. Then start listing, based on that goal or that purpose of why you would want to do it, start listing, “Okay, who are the people as I look around the organization that are connected in some way to influencing that purpose?” And list the names of the individuals. They may be in leadership roles and they may not. Don’t just look at the leadership levels. They may be at grassroots levels of the organization, really having an impact or an influence in some way on your purpose. Then, once you list their names, you want to go back and circle the ones that you already have a sufficient relationship with. You’ve already established the relationship, it’s a good relationship, and those are the ones to start with. You start with those people that you already have that relationship with because that’s going to be the easiest place to start. You do the informational interviews with those people that you already have the relationship with. A, it’s already a good relationship so they’re going to take your call, and B, they’re going to want to help you because it’s a good relationship, and C, they’re going to be more honest with you and more forthcoming with you because it’s a good relationship. That’s the first tier. The second tier would be the people that you sort of know – they know a little bit about you – but you don’t really have yet a sufficient relationship, so you want to call those the cultivators. You want to cultivate your relationship more with those people. You don’t start with the informational interview there. There, you really just connect to find out what matters to them, what’s important to them, and you cultivate, you expand on and build on that relationship. The last tier once you get through all those people are the people that are influencers but you have no relationship with them. Then you’ve got to figure out how to create the relationship with them in the first place. The way to do that is through the people you’ve already connected to. The people you know well as well as the people you’re now building upon how well you know them, and ask them to facilitate or foster or provide an access point for an introduction to the people that you don’t know as well but who are influencers. Then you’ve got to go start the relationship with those people. Halelly: Cool, that’s a whole project. It’s specific and actionable and the very next action is make the list. That’s your first steps, everyone. Thank you so much, Suzi, for sharing that as well as everything that you’ve shared with us today. How can people stay in touch and learn more about you? Suzi: I’ll give you a couple of resources. One is our website is innovativeleader.com, and you can from there learn more about how to stay in touch in lots of different ways. There’s also a leadership confidence quiz that you can access at the bottom of the homepage and it’s free and it gives you a way to get a rating on your LQA, I call it. Your leadership quotient assessment. The other resource is called the LibraryofProfessionalCoaching.com. It’s free. It’s an online library. It’s a resource of over 750 articles and it has podcasts and videos and it’s divided into categories. There are some really great leadership case studies in there and there’s some great research in there. There’s useful articles in there not just for people who might be in HR or OD or training or coaching, but really great resources for leaders as well. There’s some articles about workforce engagement and there’s articles about how to identify different challenges in the workplace. There’s just some really great resources there. And it’s all free. There’s no opt-in required or anything like that. It’s all just free, open access. Halelly: That’s fabulous. Great. Then are you on social media? Can people reach out to you that way too? Halelly: And I will link to everything I can find and everything you mentioned on the show notes page of course. I hope folks that you follow Suzi because she is, as you can see – and hear – a wealth of information and very inspiring. Suzi, thank you again for taking time to share your wisdom with the TalentGrow Show listeners. I appreciate you. I hope that everyone listening, make today great. Thank you Suzi. Halelly: You know exactly what you need to do and the very next thing you need to do is make that list. That shouldn’t take very long. Don’t wait. Do it today. That way you can get started and build some momentum to help you achieve your goals. You know, I am currently writing a book about networking, so all of this stuff is near and dear to my heart. But I wanted to tell you about something very exciting that I’ve created. It’s related to networking, but it’s really specifically related to you, which is I have created a Facebook group where we can have continued discussions about all of the topics in the podcast and any other topics related to building your leadership skills. It is called The Talent Grower’s Community. It’s on Facebook. If you go on Facebook and you search for this group, it’s a closed group so you just have to ask to join and then I will approve you and that’s going to be a great place for all of the listeners of this sow who share a passion for developing leadership skills and becoming the kind of leader people want to follow, for us to share insights, to share advice, to share our progress, to share successes, to share challenges, to ask questions, to support each other. So listeners can interact with each other and of course with yours truly. I’ll be hanging out there. I’ll be answering your questions, and this should help us all make the next year, 2017, a great year. Please, go and join this community and I’ve also created a Facebook page for the podcast, so “like” that. Like the TalentGrow Show podcast page and then join the Talent Growers Community Facebook group. I look forward to seeing you there. I’m Halelly Azulay, your leadership development strategist and until the next time, make today great.